To the chagrin of some of our readers, no, we’re not talking about the end of my blog, sorry about that. Thanks for all the feedback you are providing however. The sad news is, I’m referencing an article I recently read titled: Signs of the Human Age. Scientists have deemed Earth to be in a new epoch. An epoch is defined as a period of time in history or a person’s life, typically one marked by notable events or particular characteristics, but in this case, change is not good. We’re entering the “Anthropocene” period, a distinct change from the last epoch period, the Holocene, which started over 11,000 years ago as the ice age thawed. I don’t know if it is actually official yet as the Anthropocene Working Group is still working at it. It was about 9 years ago, flying out of Anchorage Alaska, on a rare year when the sockeye salmon of the famed Kenai River were in pretty tough shape. The Kenai is best known for holding the record Chinook salmon, tipping the scales at a whopping 97+ pounds and when I was guiding on the river 2 decades ago, the sockeye salmon run seemed inexhaustible. We used to think that about the ocean too, didn’t we? 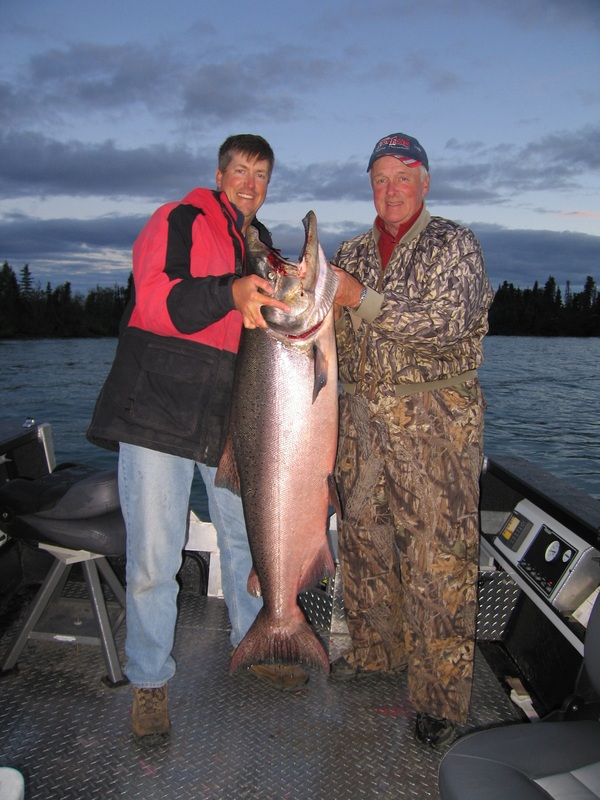 Bob Rees (left) pictured with Stan Litner and his 60+ pound Kenai Chinook salmon. I was in disbelief that I wasn’t coming home with a 50-pound wet-lock box of salmon for my short vacation up there. The runs, both sockeye and Chinook, were in disarray. What was truly puzzling, Alaska wasn’t subject to the same habitat degradation as our lower 48, where the bulk of our remaining salmon runs are comprised of hatchery fish. The term “ecological footprint” was relatively new in my glossary of terminology at the time. None-the-less, leaving Alaska with a less than impressive fish locker gave me pause to think. What have we done to Mother Earth to mess this up so bad? The lakes that dotted the already wetlands of Alaska’s tundra looked like the footprints of Paul Bunyan but leaving Anchorage International showed the huge footprint humans have left on what was once a no-sign-left-behind kinda place. Back to science class. How did we come to the determination we’re on a new era? Yes, our human footprint. Between our agricultural development, the use of large amounts of concrete, plastic and aluminum, the proliferation of nuclear fallout and subsequent detection of carbon-14 and plutonium-239 for the next 100,000 years and our dependence on landfills, urban structures and dam construction, we have so dramatically altered the ecosystems of Earth, our human footprint is irreversible. A small price to pay for “civilization?” Not so much. Activists have come to throw our own children into the spotlight, prodding them to testify in front of commissions and policy-makers, as if they are the last chance for change, since it’s our actions, or lack thereof, that they’ll be inheriting for future generations to come. Fast forward to today and our state’s fish and wildlife agency is having a deep conversation about future funding models that will keep our most treasured agency solvent. Historically, hunters and anglers have shouldered the bulk of the bill and flat lining or declining license and tag sales are not reliable enough to keep the agency running in the not-so-distant future. The state legislature had plenty to say about this in the last legislative session and set up the current task force with the help of the Governor’s office. One of the participants, an over-qualified “Change-agent,” by the name of Jim Martin, has enabled our collective fish conservation organizations to participate through a sub-group. Our groups vetted a few concepts including establishing criteria that would make this an effective process and “What would you do if you were king for a day.” It was a productive exercise but one of the criteria that came forward was the need to be visionary. By being visionary, one would be expected to look into the future, and forecast the needs and future goals of the agency. It’s an exercise that is grossly absent in politics, clearly. Although we certainly have enough knowledge to produce a visionary product, there are certainly issues that will come up that we had no capability of forecasting. It will be critical to explore some of the more obvious financial challenges our natural resource agencies will face in the future, especially given climate change and ocean acidification that is only being studied right now. Future listings of endangered species, lawsuits that demand policy changes and future fluctuations in outdoor recreation participation are just a few, all of which affect funding capacity for our state’s agencies. It will also be up to us to engage with our legislators on visionary legislation that protects our natural resources as well. Recent actions by our regions Pacific Fishery Management Council were visionary when they protected unmanaged forage species earlier this year. With worldwide depletion of fishery resources becoming evident, don’t you think it was a good idea to protect fragile species that aren’t currently being fished, but surely will see future pressure as the value of the prey base increases? Our argument was keep these fish in the ecosystem, where they feed our salmon, steelhead, tuna and a plethora of other species. The alternative; shipped to other countries and turned into cat food, poultry food or tossed to net-pen held schools of tuna, destined for the sushi market. How’s that for a visionary course of action? Anyone want to take on the conservation of Bluefin tuna? Good luck with that. The future is ripe with opportunity. The reauthorization of the Magnuson Stevens Act may just be months away. It will be celebrating its 40th anniversary in April. Policy-makers worked with credible scientists to make it visionary legislation during the last reauthorization in 2006. The results are in and it’s a success. Let’s hope policy-makers can see past the politics, make improvements where necessary and keep the policies in place that will likely continue to work for the future.